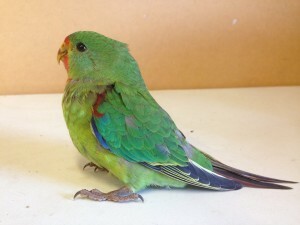 Swift parrot - concussed but okay! Have a look at this little beauty! This is a young Swift Parrot that was clipped by a car down on Bruny Island on one of the very windy days we have had in Hobart this past week. Lucky for our feathered friend (pictured below), he was not badly injured and ended up with just a mild concussion. Swift Parrots are a rare and threatened species and are what we call breeding endemics, which means they only breed in Tasmania. When they are not in Tas they spend their time on the mainland of Australia, covering areas throughout Victoria and NSW. It is estimated that the Swift Parrot population is approximately at less than 1000 breeding pairs, hence them being on the threatened species list. The reason for their decline is that the parrots mainly feed on the nectar of blue gum flowers (Eucalyptus globulus). Their breeding ranges are confined to the areas in Tasmania where blue gum trees occur, which is mainly on Tassie's east coast. Blue gum trees are found mostly on unprotected land and they are disappearing fast. Clearing for agriculture and timber harvesting means that the removal of these old trees is lowering the age of our blue gum forests. The older the tree the more flowers and nectar the tree produces for birds such as swifts and also for any other nectar-feeding animals. The loss of these old trees and the effect it has had on the swifts means that they simply cannot get what they need to survive from their usual food source during breeding season. This is the major reason for the Swift Parrot's decline and another issue is that the old trees provide important nesting hollows which are essential to the breeding success of the Swift Parrot. Help save these beautiful birds and protect blue gum trees on your property!